Browse Artists and Groups Albert H. Robinson, R.C.A. Albert H. Robinson was born in 1881 in Hamilton, Ontario. Initially self taught, he obtained his first art-related job the summer after graduating high school as Chief Illustrator for the Hamilton Times, which paid him $5.00 per week. By 1903, Robinson had saved enough to continue his schooling overseas. That year he moved to Paris where he studied at the Académie Julian and subsequently at the École des beaux-arts under Gabriel Ferrier. While in France, Robinson began to paint in watercolour and oil and was introduced to the English painter Thomas William Marshall, with whom he traveled and painted for two summers. Returning to Hamilton, Robinson got a job in the studio of John S. Gordon. There, in 1906, he exhibited in his first group exhibition. His abilities soon drew the attention of Mr. and Mrs. William Davis who, believing that Robinson would have a better future in Montreal, found him a studio there, guaranteed his rent and introduced him to some of the leading figures in Canadian art including William Brymner, then President of the Royal Canadian Academy (R.C.A. ), Edmond Dyonnet, R.C.A. Secretary, and Maurice Cullen. His first paintings were exhibited at the Royal Canadian Academy in 1909. In 1911, at age 30, he became one of the youngest members to be elected associate of the R.C.A. The National Gallery of Canada bought its first Robinson in 1912, and several more after the First World War, during which Robinson inspected munitions at Dominion Copper Products. He became a full member of the R.C.A. in 1920, the same year he exhibited alongside the Group of Seven in their first exhibition as one of three guest exhibitors. Randolph Hewton and Robinson's good friend, Robert Pilot, were the other two exhibitors. Just before the war, Robinson had been introduced to A.Y. Jackson and the two went to Europe to paint shortly thereafter. 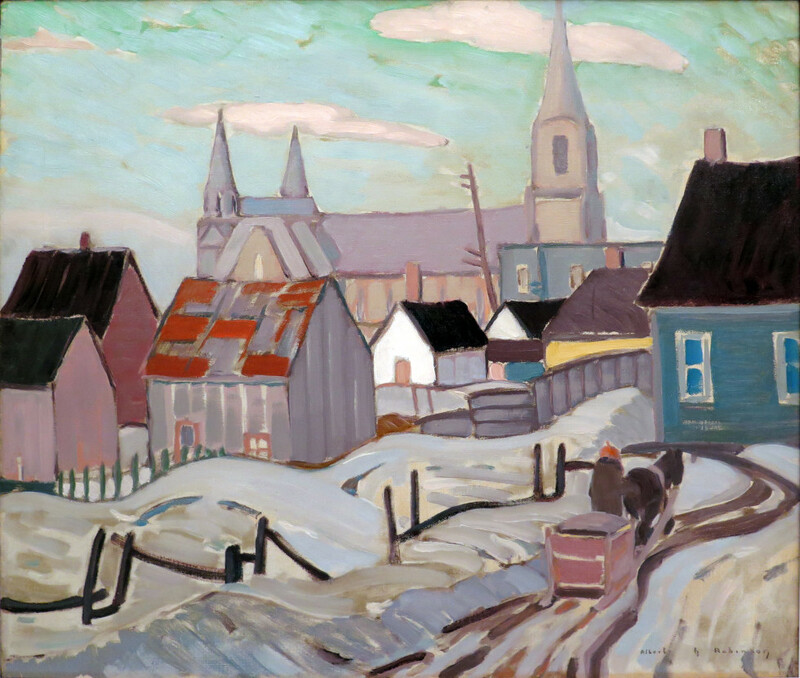 After the war, these two artists, along with Hewton, Clarence Gagnon and Edwin Holgate, organized painting trips to some of the most colourful areas of Quebec, along the St. Lawrence River between Montreal and Quebec City. By now Robinson was a member of the Arts Club, exhibiting annually at the Royal Canadian Academy and the Art Association of Montreal. Robinson was a founding member of the Canadian Group of Painters in 1933. Disaster struck Robinson in 1933 when he suffered a heart attack and subsequent complications, including arthritis, which forced his early and complete retirement from painting. He was ordered to take up golf to placate the arthritis and, although he was eventually forced to give this up too, it was at the Marlborough Country Club that he met Marion Ethelwynne Russell, who he married in 1952. Although Robinson remained energetic and gracious until his death in 1956, he was never able to lift a brush after his heart attack. As a result, great Robinson works are extremely rare and now, highly sought after. In 1994, Walter Klinkhoff wrote, "I have always held Albert Robinson in the highest esteem. He has been my personal favourite Canadian artist and I would rate him amongst the very best. I know of at least three distinguished Canadian artists who declared without hesitation that Robinson was their favourite also. They were Harold Beament, Henri Masson and Robert Pilot." (Walter Klinkhoff, Albert H. Robinson Retrospective Exhibition. 1994, pg. 1). Robinson is known as a most distinguished colourist, "of the first order," according to the Group of Seven's Dr. Arthur Lismer. Robinson had a notable awareness of modernist techniques and he rendered his paintings successfully by reducing the landscape to only its most essential and joyous elements. He is also greatly admired for his ability to accomplish the remarkable task of delivering harmonious compositions in low tone and high key. In 1956, Thomas R. Lee referred to Robinson's work as, "purely Canadian - with no trace of European influence." He describes the artist himself as, "a Painter's Painter [with] ...no commercial influence at all; he painted for the love of painting." (Thomas R. Lee, Albert H. Robinson: "The Painter's Painter". Pamphlet. 1956). 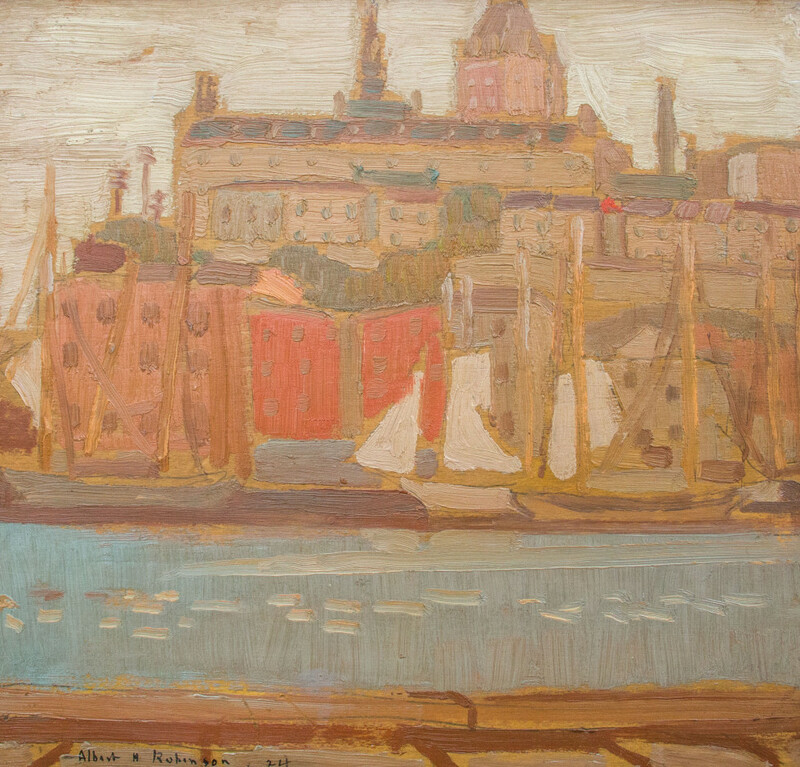 The career of Albert H. Robinson has been celebrated and honoured numerously, beginning with a joint retrospective exhibition by the Art Gallery of Hamilton, at the National Gallery of Canada in 1955, at subsequent exhibitions at the Kitchener-Waterloo Art Gallery in 1982-83 and at Galerie Walter Klinkhoff in 1994. His paintings can be found in the permanent collections of the Luxembourg in Paris, National Gallery of Canada, Montreal Museum of Fine Arts, Art Gallery of Ontario, Musée national des beaux-arts du Québec, Canada House in London, England and several other institutions. Source: Galerie Walter Klinkhoff's Albert H. Robinson Retrospective Exhibition Catalogue (1994). We are grateful to Mrs. Thomas R. Lee who has so graciously allowed us to reprint excerpts from her husband's privately printed biography (1956). Please send me more details about the following artist. Albert H. Robinson, R.C.A.